This is an arcade-style fighting game in which players compete in one-on-one/three-on-three tournament matches to lay claim to the title of King of Fighters. Players punch, kick, and use special abilities (e.g., fireballs, electrical strikes, sand blasts) to drain opponents’ life meters. Combat is accompanied by frequent impact sounds, cries of pain, and colorful light effects. Several female characters are depicted in low-cut outfits that display large amounts of cleavage and/or buttocks. Female characters’ breasts sometimes jiggle during matches. One female character’s special attack depicts her pulling an opponent’s face to her breasts. A handful of sequences depict close-up shots of a character smoking a cigar and a character drinking from a sake bottle. Some still-image screens show drunken characters holding glasses of beer. The words “sh*t,” “d*ck,” and “a*shole” appear in the dialogue. 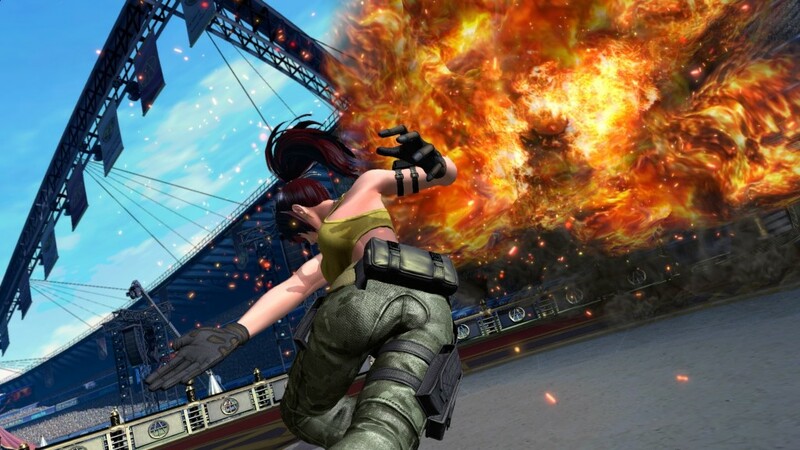 The King of Fighters XIV is expected to come out for the PS4 on the 23rd of August in the North American region. You can preorder the upcoming fighting game, if you are interested, on Amazon with this link.